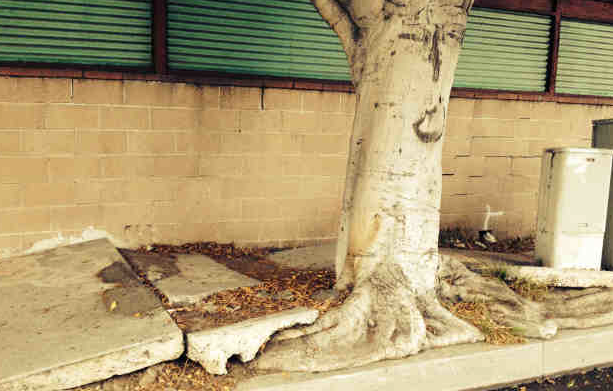 According to the article, the problem of determining responsibility is complicated by the fact that the City took responsibility for fixing the sidewalks damaged by street trees during the 1970s. The City apparently did this even though it did not necessarily plant the trees. But then the City stopped that program. It also stopped a program that would allow homeowners to pay half the cost of fixing the sidewalk. And now, the sidewalks are in terrible condition and are generating a lot of claims and lawsuits. The City is looking at transitioning responsibility. There is also a movement to reinstate the program where owners of property adjacent to the broken sidewalk can pay half the cost of fixing the sidewalk. Many California condominium and homeowners associations are facing similar problems. A lot of maintenance and repair was deferred during the Great Recession because community associations were lacking funds as a result of many owners not paying their assessments or fees. And now, those associations are going to have to deal with broken up sidewalks, potholes, and the list goes on and on. We find that many California condominium associations are also dealing with inconsistent policies regarding maintenance and repair. Some associations have taken on responsibility for maintenance and repair of building components that are really the individual owner’s responsibility under the CC&Rs. And in many other situations, and a far bigger problem, is the fact that many condominium associations have incorrectly operated under the assumption that responsibility for maintenance and repair of certain components is assigned to the owners when it is actually the association’s responsibility under the CC&Rs. Or, the CC&Rs actually do assign certain responsibilities to the owners which really should be assigned to the association. For example, this is a common issue in connection with balconies and patios. Sometimes, the individual owners are assigned (or the association assumes they are assigned) too much responsibility for these areas under the CC&Rs. As can be expected, some owners will not perform necessary repairs. Then, the lack of repair results in additional damage to the common area, adding up to a greater total cost of repair. And in some situations, owners that have paid for repair of their balcony decks or other components which are common area and their association’s repair responsibility under the CC&Rs are seeking reimbursement because their associations are now correctly taking on the task of maintaining these components. These are not easy problems to resolve. Transitioning maintenance and repair responsibility is difficult but in most cases must and can be done. Associations obviously cannot go back and try to collect the cost of repairing the dry rot and other damage that occurred because an owner did not repair/maintain their balcony (and it leaked and caused dry rot) if it was always the association’s responsibility under the CC&Rs. And many associations have learned the hard way that not accepting responsibility can lead to expensive and time-consuming lawsuits. If you are Association is facing this kind of dilemma, it is best to come up with a plan. Talk to your management and consult with your community association attorney. This situation must be dealt with by a team, and it will not be easy. Nor will it be inexpensive. But it must be done. And if you have not had your maintenance responsibilities reviewed by legal counsel, maybe it is time to have them reviewed. Associations should talk with their legal counsel about developing a maintenance and repair checklist that lists and assigns responsibility, and refers to the CC&Rs for the authority. Or, if you would like to propose changes to the responsibilities in your CC&Rs, your legal counsel can assist you in preparing a proposed amendment by secret ballot. If you want SwedelsonGottlieb to provide a quote for amending your CC&Rs, please contact our office. By being proactive, associations can hopefully avoid the “transition” debate with the owners.